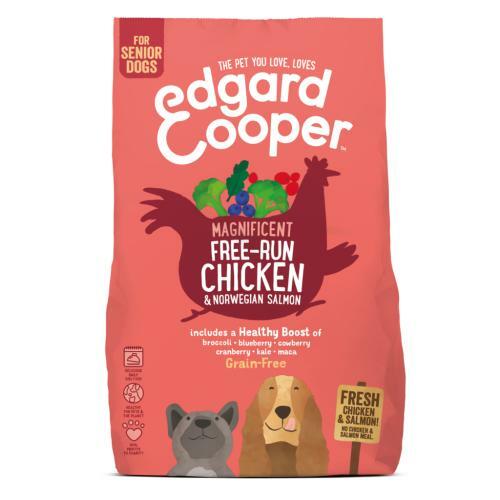 EdgardCooper Chicken & Norwegian Salmon Grain Free Senior Dog Food is a delicious and fresh recipe that's made directly from fresh Chicken & Norwegian Salmon, ensuring only the best protein is included! This kibble is the world’s first to be made direct from fresh chicken & salmon with no chicken/salmon meal or dried chicken/salmon, so it’s packed with the very best protein. This means it is highly nutritious and easily digestible. Every pack bursts with tasty veggies, fruit and botanicals, giving me all the vitamins, minerals and antioxidants I need to keep me healthy nose to tail.